It can be easy to conflate the common cold with the more serious flu when we're hiding under a duvet feeling worse for wear. But how can we actually tell the difference between the two? While a cold and the flu share several symptoms, there are clear ways of differentiating between them - and this can be vital when deciding how to treat your illness. Both the cold and the flu are respiratory illnesses with very similar symptoms. However, these symptoms can be less severe if you’re suffering from the cold. “The common cold and flu are different conditions, but often share some of the same symptoms in the early stages, such as a headache, runny nose, or a sore throat,” says Professor Helen Stokes-Lampard, chair of the Royal College of General Practitioners. The first sign of a cold can appear in the form of a sore throat, the NHS says. This will typically be accompanied by a runny nose and slight congestion of the sinuses. You may then develop a cough after a few days, with children more likely to also experience a fever. While it isn’t pleasant to experience symptoms of a cold, you may still feel as though you’re well enough to carry on with normal everyday activities such as going to work. The symptoms of the flu run pretty much along the same lines as the cold, although they may be more acute and materialise rapidly. “The difference is that flu is potentially much more serious, particularly for children and the elderly, and tends to leave people feeling unwell for much longer, sometimes taking a week or two to fully recover,” Professor Stokes-Lampard explains. Additional symptoms that people may experience when suffering from the flu include a fever, headaches, achy muscles, an upset stomach and nausea. If you’re experiencing the flu, then you’re far more likely to feel overly fatigued and unable to continue with your everyday routine as usual. Colds spread extremely easily, especially when you spend a lot of time in close proximity with other people. This can be particularly relevant if you work in an open-plan office or if you take public transport to work. Germs that are spread from coughs or sneezes can survive for up to 24 hours, which is why taking some simple precautionary measures could do you and those around you a whole lot of good. The NHS recommends that you wash your hands with warm water and soap regularly and avoid sharing items such as towels or cups with people who may be infected. If you’re in the early stages of a cold, make sure you use tissues when you cough or sneeze and then discard them in a bin as soon as possible. Also wash your hands regularly to avoid spreading the germs. To safeguard yourself from the flu, Vicks advises that you boost your immune system by sticking to a regular bedtime and keeping yourself fit and healthy. Due to the unpredictable nature of the flu, having the flu jab is also a wise course of action if you’re more vulnerable to the illness than others. Those who are deemed as being high-risk, including people who are over 65, pregnant or have a serious health condition, are eligible for a free flu vaccine through the NHS. The flu jab will provide you with greater protection from the various strains of the flu that spread on an annual basis. Symptoms of a cold such as a high temperature and fatigue don’t usually last longer than seven to 10 days in adults and older children, the NHS explains. For children under the age of five, colds can last for up to 10 to 14 days. While you may start to feel better a week or so after contracting a cold, you may still experience coughing and a buildup of mucus for around two to three weeks. As long as you have any symptoms of a cold, whether it’s the slightest cough or occasional sneeze, you will still pose the risk of infecting others with the virus. If you have the flu, your symptoms may start to abate after a week, although the NHS states that you might still feel weakened for a longer period of time. 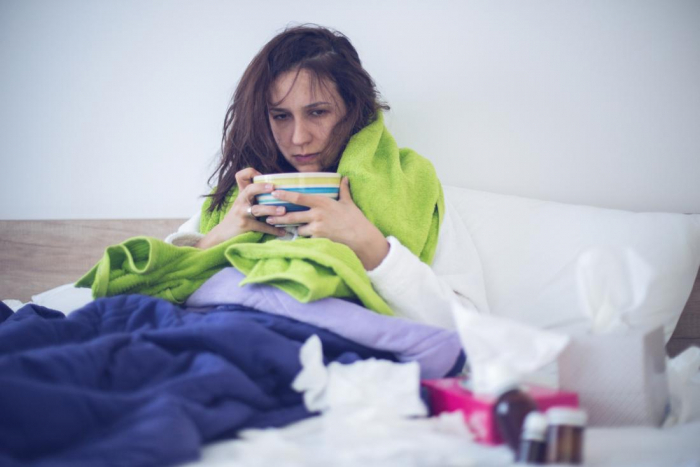 While you may make a full recovery in the space of a week or two, catching the flu could lead to a variety of other health problems if you’re particularly susceptible to infection. The common cold does not usually lead to other serious health conditions. However, symptoms of a bacterial infection can sometimes be mistaken for those of a cold, in which case you could be at risk of further illness. These bacterial infections include conditions such as bronchitis and sinusitis. Those who are classified as being high-risk may find themselves more prone to developing severe illnesses following a bout of flu. While it is unlikely that a cold will manifest into pneumonia, bacterial infections or hospitalisation, this is a greater possibility for people with the flu than those suffering from a cold, as explained by the Centres for Disease Control and Prevention. If you catch a cold, you’ll ordinarily be capable of treating yourself with a few simple measures. “While the common cold and the flu can be very unpleasant, they are unfortunately the result of viruses, which means they have no cure and patients are usually better off treating them at home with simple self-care remedies,” Professor Stokes-Lampard outlines. The NHS has advised that anyone with a cold has plenty of rest, keeps themselves warm and drinks lots of fluids to avoid dehydration. You can also buy over-the-counter cough or cold medicines or pain relief from your local pharmacy to ease your symptoms and ensure your comfort. If you have a cough, drinking hot lemon with honey can have the same effect at soothing your throat as cough medicines, the NHS states. As with the cold, flu symptoms can often be treated from home by having lots of rest and taking medicine such as paracetamol or ibuprofen to lower your temperature. According to the NHS, GPs won’t recommend you take antibiotics for flu as contrary to popular belief, they don’t speed up your recovery. "Antibiotics are medicines used to treat infections caused by bacteria. Antibiotics don't work against infections caused by viruses, such as colds and flu," writes the Health Service Executive of Ireland. "So there's no point taking antibiotics to treat a cold or flu, and no point asking your doctor to prescribe them for a cold or flu." Your local pharmacist can provide you with any additional advice on flu treatment should you need it. If you're suffering from the flu, Professor Stokes-Lampard advises taking some time to consider whether or not you need to visit a doctor or can be treated from home. “We encourage patients who are ill to think hard about whether they do need to see a GP – not just in terms of reducing pressures on the NHS, but to minimise the possibility of passing viruses, such as flu, to other people, particularly in at-risk groups, such as those with long-term conditions or pregnant women," the professor says. If your flu symptoms don’t improve after seven days, then the NHS recommends arranging an appointment with your GP.